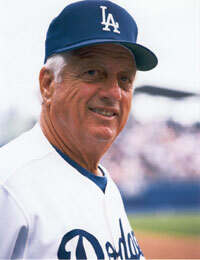 Tommy Lasorda, Major League Baseball Hall of Famer and Dodgers great, will be honored at the National Italian American Foundation (NIAF) West Coast Gala on Thursday, May 19, 2011. Twelve-time MLB All-Star Mike Piazza will present Lasorda with the Foundation's Lifetime Achievement Award in Sports Management at the Fairmont Miramar Hotel & Bungalows in Santa Monica, Calif.
Grammy nominated songwriter, record executive, music publisher, author and former American Idol judge Kara DioGuardi will join Lasorda. DioGuardi will receive a NIAF Lifetime Achievement Award in Music. This year's gala honorees receiving NIAF Special Achievement Awards include Dana Brunetti, Oscar nominated film producer whose credits include "The Social Network"; Jon Favreau, actor, screenwriter and director; Thomas V. Girardi, one of the nation's prominent trial lawyers; and Gary Sinise, Emmy and Golden Globe Award winner. The evening will include a special tribute honoring the late Joseph R. Cerrell, one of the Foundation's leaders and legendary Los Angeles public affairs consultant. Cerrell served as NIAF's national vice chairman, president and a member of the Board of Directors for more than 16 years. Hollywood's notables will include Academy Award-winning actor Ernest Borgnine; Olympic Gold Medal figure skater and Food Network TV chef Brian Boitano; actor, screenwriter and producer Marco Bonini; actor Robert Davi; TV and film star of "The Incredible Hulk" Lou Ferrigno; one of the famed Jonas Brothers, Nick Jonas; actor Francesco Quinn; E! News anchor and managing editor and member of the NIAF Board of Directors Giuliana DePandi Rancic; actor and model Antonio Sabato, Jr.; and TV and film star Brenda Vaccaro. Film and television star, producer and director Joe Mantegna will be this year's master of ceremonies. Actor and singer Franc D'Ambrosio, of "Phantom of the Opera," will sing the U.S. and Italian national anthems and entertain guests with his vast repertoire of songs.